Are you looking to improve your home's appearance and energy efficiency? Replacement windows might be the right solution for you. Kuhn Construction installs high-quality vinyl, fiberglass and wood windows in a variety of styles that can help save you money on heating and cooling costs. Our specialists can help you choose the perfect new windows for your home that will offer easy care and look great for years. 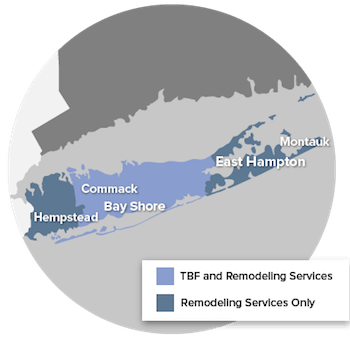 Contact us today to request a consultation and free estimate on your window installation in Islip, Long Island or the surrounding area. Energy savings: Replacement windows seal air leaks and come with insulated glass, reducing the burden on your HVAC system to regulate temperature in the room. Aesthetics: New windows stand out on both the inside and outside of your home, and with a variety of styles and materials available, you can create the right look for your home. Easy to maintain: Windows made from a low-maintenance material like vinyl are very durable and won't need to be regularly cleaned over the life of the window. Home value: New windows are a great way to increase home value due to their energy efficient properties and positive effect on home appearance. Kuhn Construction is the trusted home remodeling contractor for replacement window solutions in Brookhaven, Islip, Smithtown and Suffolk & Nassau County.